The director of planning and research at the West Africa Health Organization, (WAHO), Salifou Zouma, has updated the meeting of health experts on challenges facing West Africa. 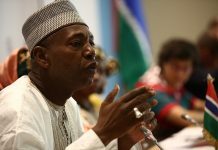 Mr Zouma gave the update during the 19th Ordinary Assembly of ECOAWS Health Ministers which recently wound up in Banjul, the Gambia. Presenting the WAHO annual report intended as a summary of the main achievements and outcomes of the 2017 Action Plan implementation, Mr Zouma pointed out that in 2017, ECOWAS countries grappled with recurring epidemics of cholera, meningitis, measles and Lassa fever. “Eight countries in the region (Benin, Côte d’Ivoire, Ghana, Guinea, Liberia, Niger, Nigeria and Sierra Leone) reported 4 460 cases of cholera including 116 deaths, representing a lethality rate of 2.6%,” he stated. “A cumulative number of 6414 suspected cases of Yellow fever, including 51 deaths was recorded in thirteen (13) countries with the exception of Cabo Verde and Guinea-Bissau,” noted. Tuberculosis, Mr Zouma added, remained a major public health problem in the region. “The estimated prevalence of the disease varies from 46 per 100, 000 inhabitants in Togo to 374 per 100, 000 in Guinea-Bissau in 2016, with ten countries out of the 15 of the community having a level of incidence greater than 100 per 100, 000 inhabitants,” he intimated. He said the number of people living with HIV/AIDS (PLWHIV) was estimated at about 5,000 000. “The median HIV prevalence in the general population aged 15-49 years was 1.6% with variations across countries. Less than 1% in Burkina Faso, Cabo Verde, Niger and Senegal, between 1% and 2% in Benin, The Gambia, Ghana, Guinea, Liberia, Mali and Sierra Leone and more than 2% in Côte d’Ivoire, Guinea – Bissau and Togo.” “Women accounted for 58% of adults and 50% of all PLWHIV,” he concluded. Next articleShould We Foul Our Nest-Environment?